One of the most surprising stories of the Olympics’ first week was the four gold medals won by North Korea. The athletes’ achievements have inspired a nation – depending on who you ask. 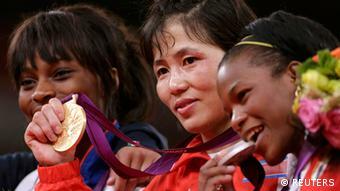 One thing is certain: for North Korean athletes, winning has a special meaning. “As an athlete I believe by winning the gold medal I was able to glorify my nation and give support to the people of my nation, so I am really happy,” judoka An Kum Ae told reporters after winning gold in the 52-kilogram category on July 29. “I believe I gave some happiness and joy to our leader, Kim Jong Un,” she added. Likewise, when Om Yun Chol won men’s 56-kilogram weightlifting gold with a remarkable clean and jerk, he had no doubt where the credit lay. The North Korean athletes’ achievements in London have, apparently, inspired the masses. “I will devote myself to building a thriving nation, true to the leadership of respected Marshal Kim Jong Un, as the gold medallists did for the country,” power sector worker Yu Jung-Ryol was quoted as saying by the official Korean Central News Agency (KCNA). 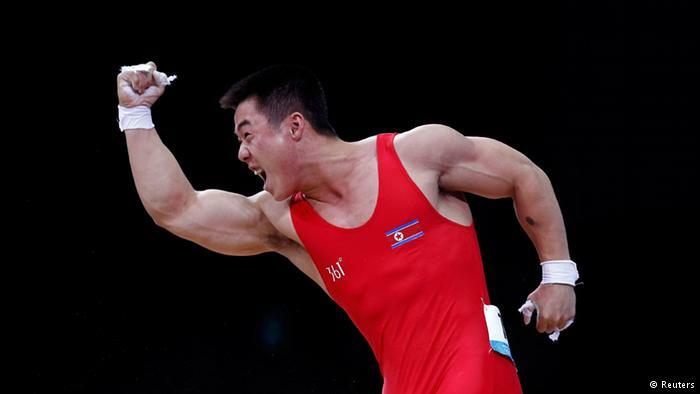 But just how inspiring are the Olympians to ordinary North Koreans? The issue is a murky one. “Any success [by North Korean athletes at the Olympics] will be used extensively for propaganda purposes,” explained Grigore Scarlatoiu, Executive Director of the Committee for Human Rights in North Korea (HRNK), a Washington, D.C.-based non-profit. North Korea’s impressive Olympics performance so far has unsurprisingly received enthusiastic coverage from state media like KCNA. “DPRK People Seized with Joy over Successes in Olympiad,” said one headline on July 31. The DPRK is the acronym of North Korea’s official name, the Democratic People’s Republic of Korea. “As the DPRK flag was hoisting higher than others, I got so excited that I could hardly repress my tears rolling down my cheek,” Jong In Ho, a teacher at Kim Il Sung University in Pyongyang, was quoted as saying following the DPRK’s first gold medal. Politics are ever-present in impoverished North Korea. Below the story on the North’s Olympic accomplishments, an english headline said, “Let Us Cut Off Windpipes of the Lee Myung Bak-led Swarm of Rats,” a reference to Lee Myung bak, president of neighboring South Korea. “Let Us Blow Up the Bases Used to Hurt the Dignity of Our Supreme Leadership!” screamed another. But the Olympics propaganda doesn’t just end with a media that Reporters Without Borders ranks as second-to-last in its annual Press Freedom Index, ahead of only Eritrea. “The main slogan of the DPRK Olympic team, serving in London, as well as all the athletes of this country, [is] ‘Forward to victory,'” said Aksentijevic Lazar, chief delegate of the Korean Friendship Association (KFA) of Serbia. “This phrase at once became ‘airborne’ in the People’s Republic,” he added, pointing out it was mentioned by Kim Jong Un in an early August speech. Founded in 2000 with the purpose of building international ties between North Korea and other countries, the KFA is seen by some as an arm of the North Korean government. Lazar also said the attitude of North Korea’s Olympians was an example other North Koreans should emulate. “[Western] ‘athletes’ are constant defendants in criminal news, in a fit of mindless rage [zealously] killing and maiming people from the masses on the streets of the capitalist city,” he said. One team that probably won’t be receiving much more North Korean media coverage is the women’s soccer team. Needing at least a tie to advance to the next round of competition, the team – none of them thought to be older than 25 – faced the US on July 31. Despite a stingy defense, the North Korean women fell to the heavily-favored Americans, 1-0. The loss meant their Olympic dreams were over. As the American women joined hands and danced for fans, the stony-faced North Korean players exited the stadium without talking to journalists. Speaking through an interpreter, coach Sin Ui Gun cautiously fielded questions. “We are all thinking that against USA we shouldn’t lose, we should win,” Sin told reporters. Pressed whether it was more disappointing to lose against the US than other teams, he said nothing.